Depart early morning from Marrakech by 4×4 to Ait Ben Haddou, through the High Atlas mountain pass of Tizi-n-Tichka and Telouet where you will visit the famous Kasbah Telouet, one of the former residences of Pacha Glaoui. After lunch visit the nearby salt mines and continue through the Ounila Valley, a part of the main caravan route from sub-Saharan Africa to Marrakech, and the narrow river valley connecting Telouet and Ait Ben Haddou. After arriving in late afternoon in Ait Ben Haddou, visit the stunning Ait Ben Haddou Kasbah, a UNESCO World Heritage Site. Continue to your hotel in Ait Ben Haddou for dinner and the night. Depart from your hotel by 4×4 in early morning for the multicolored rock walls of Dades Gorge, along Lake Ouarzazate via the road of kasbahs. Pass through Skoura, a fertile oasis lined with immense palm groves, to reach the home of Morocco’s Rose Festival, El Kelâa M’Gouna (commonly referred to as the Valley of Roses. Continue through the Rose Valley and Ait Said, Tourbist, and Tamalout to reach the village of Bou-Thahrar. Enjoy a walking tour beside the River M’Goun, then continue by 4×4 to the Kasbah of Ait Youl Glaoui in the Dades Valley with its colorful rocks and ancient kasbahs. Arrive at your hotel in Dades Gorge in late afternoon for dinner and the night. After a traditional Moroccan breakfast, enjoy an hour of hiking to reach the canyons of Dades Gorge and the stunning scenery of the area. Lunch at the gorge and continue to Todgha Gorge via the village of Tinghir. Arrive at your hotel after a stroll through the impressive gorges for dinner and night at your hotel. After a traditional Moroccan breakfast, depart to Zagora via the village of Alnif, crossing the Jebel Saghro via the mountain pass of Tizi-n-Tazazert and the village of Tazarine. After lunch in Tazarine, continue to Zagora via the village of Taghbalt and the High Atlas mountain pass of Tizi -n- Tafilalet. Arrive late afternoon at your hotel for dinner overnight. Early morning departure for M’Hamid, stopping in Tamegroute to visit the Koranic library, the manufacturing location of the unique green pottery of Tamgroute, and the underground streets of the village. Continue through the villages of Nsrat and Bnisbih to Foum Takat, in the great oasis of Ktaoua, hike in the oasis and enjoy tea with locals.. Lunch in M’Hamid and trek to the bivouac to watch sunset over the dunes. Traditional nomad dinner and overnight under the stars or in nomad tents. A day to relax and enjoy the serenity of the desert. Read, meditate, yoga or walk through the dunes. Enjoy a traditional lunch in a village family as part of our locale lifestyle program. Participate with the family in gathering wood for the cooking fire, preparing the meal and other activities. Discover local life in the last oasis of the Draa Valley. Late afternoon, return to the camp to watch the sunset and a traditional nomad dinner and overnight under the stars or in nomad tents. After watching sunrise over the dunes and a traditional nomad breakfast, enjoy a visit to the ancient village of M’Hamid. 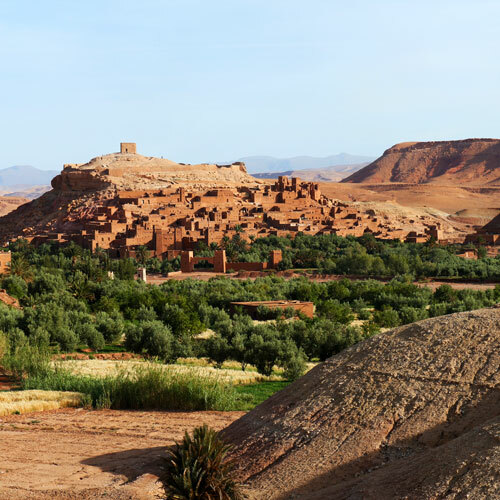 Return to Ouarzazate through the Draa Valley oasis of Zagora and through Tansikht. Lunch in Agdz and continue on to Ouarzazate. Arrive at your hotel in Ouarzazate in late afternoon. After a traditional Moroccan breakfast, depart from your hotel to Marrakech back through the High Atlas mountain pass of Tizi-n-Tichka. Lunch on the way and arrive late afternoon at your hotel in Marrakech.